Country Bears to skip Christmas this year? We've been informed that the Country Bear Jamboree is not getting its annual conversion to the Country Bear Christmas Special this year. Reportedly, the change was made by management for budgetary reasons. However, we are also hearing that the decision is not yet etched in stone, and that there could be a change of plans "if something big happens, like if the Guests speak out." 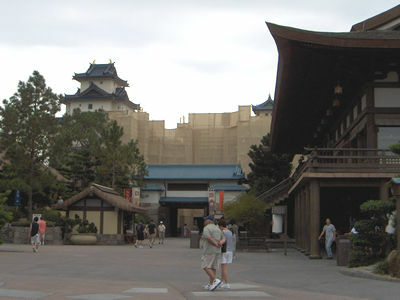 Refurbishment continues at the rear of Epcot's Japan pavilion. Photo by Cathy Sowa. On October 1, Walt Disney World raised its shipping fees for merchandise shipped from the WDW resort. The fees are still based on the value of your purchase and how quickly you want it delivered, but they have raised shipping rates as much as 400 percent across all tiers and removed the shipping cap for orders over $1000. For orders up to $50, the shipping fee is $8.95 for 14-20 day ground shipping, $23.95 for 4-7 day air shipping, and $33.95 for 3-5 day air shipping. For larger orders, the price climbs to over $150 for orders up to $1000. Orders over $1000 now pay around 15 percent shipping. These fees apply to orders shipped home from the resort, or ordered through Walt Disney World Mail Order. There is also a cut-off in early November beyond which any orders placed after that date must be shipped via the Air methods, and are only guaranteed for delivery before Christmas. So it's possible that you would order something on, say, November 20, pay for 4-7 day air shipping, and not actually receive it until December 20th. The dinner hours at Hollywood & Vine at the Disney-MGM Studios reportedly changing during the holiday peak next April. From April 9 through April 22, the dinner buffet runs from noon until 9:00 p.m. The dinner buffet does not have character appearances, which means that essentially the lunch character meal will not be served and lunch prices will rise to dinner levels during this time. No other full service restaurants at the Studios will change their hours during this time. Thanks to Matt Hochberg of MGMStudios.org (link) for the information. 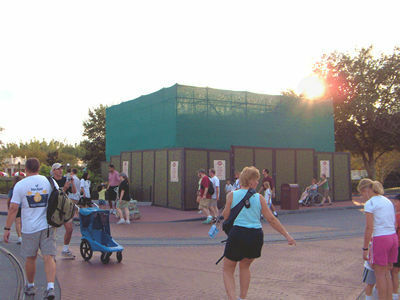 A construction wall surrounds the outdoor vending location at the west side of the intersection of Main Street and the hub. Photo by Cathy Sowa. One of the special things during MouseFest's Mega Mouse Meet event (Saturday, December 9 from 1:00-3:30 p.m.) is that we station representatives from participating communities outside the meeting room to greet newcomers. Disney Internet fans are sometimes shy and not sure about this whole "meeting face to face" thing, and having a friendly face greet them and welcome them makes a big difference! Each participating community is being asked to provide at least three volunteers who are willing to act as greeters. They'll need to work just one hour each (or less, if we have enough), which will leave them free to enjoy the event the rest of the time. The one-hour time commitment worked well last year, so that's what we're planning for this year, too. In general, greeters do the following: welcome folks to the MegaMouseMeet, make sure each person has a name tag (greeters will walk around with the same label sheets as on the reception table), assist folks finding the webmaster, author, community, or company they may be looking for, hand out Swag Bags and Pocket Guides, and offer general assistance. If you're planning to attend the Mega Mouse Meet and would be willing to help out as a greeter, please let me know by sending me an e-mail with your name and e-mail address (so that you can be contacted with further information and they can check you against the list at the volunteer check-in. In order to assure that the volunteer coordinator has enough time to work the scheduling of all volunteers, please sign up by November 8 if you can help us out. The construction area fills the entire corner, a much larger area than just the vending location. Photo by Cathy Sowa. Just a reminder that MouseFest is scheduled for December 3?7 (sea) and December 7?11 (land). MouseFest Sponsor MousePlanet is organizing three events and officially participating in a fourth during the land portion, with a fifth being organized by David Koenig, MousePlanet staff writer and author of the "Mouse Tales" series of books. For more information and to find out how to let us know that you're coming, visit our MouseFest events page. For more information on MouseFest, visit the MouseFest event site (link). For those looking for something different to do outside the parks while the Super Soap Weekend is holding fort at the Disney-MGM Studios next weekend, the 31st annual Festival of the Masters at Downtown Disney provides a chance to see art in all sorts of media. Awards totaling $40,000 will be presented in 10 categories: clay; drawing, printmaking, and digital art; glass; jewelry; leather, wood, fiber and paper; mixed media and collage; painting; photography; sculpture; and watercolor. In conjunction with Festival of the Masters, the House of Blues is hosting 40 folk artists for its ninth annual "Where the Art Meets the Soul" Folk Art Festival. The weekend also features live musical entertainment, chalk art and children's activities. The event runs from 9:30 a.m. to 5:30 p.m. November 10-12. 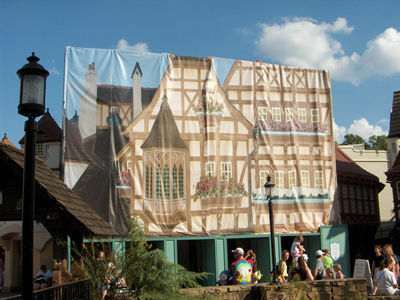 A decorative scrim covers the construction area over the restrooms adjacent to Peter Pan's Flight in the Magic Kingdom. The work currently involves remodeling of the restroom stalls and facade maintenance, but no changes to existing structures are being made right now (though that could change in the future). Photo by Cathy Sowa. The Osborne Family Spectacle of Lights is set to turn on just two weeks from tonight. When it does, it will feature choreographed "dancing" lights that perform in synchronization with a medley of holiday music every 15 minutes. Over 400 dimmers will control the special effects, which are expected to work in a similar fashion to the Lights of Winter at Epcot. The entire display, from building facades to trees, wreaths to bells, and holiday figures will all "dance" as the "snow" falls. The Spectacle runs nightly from November 13 through January 7. Construction walls at the Disney-MGM Studios protect the installation work on the Osborne Lights. Photo by Cathy Sowa. Special holiday entertainment, decorations and events are on tap for Disney cruises starting late this month and running through the New Year. Cruisers aboard the Disney Magic and Disney Wonder will enjoy Thanksgiving dinners with all of the trimmings, along with craft activities focusing on pilgrim hats and turkeys. Mickey and Minnie will also make appearances in Thanksgiving costumes. The Magic sails a special Western Caribbean itinerary over the holiday, featuring two visits to Castaway Cay. The second visit occurs the day after Thanksgiving, and features the debut of the island's holiday decorations. Some of the decor may be up for the visit of the Wonder on its four-night cruise that stops at the island on Thanksgiving Day. Castaway Cay will be transformed into a "Magical Wonderland" featuring Christmas trees, carolers, "snow" flurries and more. Mr. and Mrs. Snowman, properly attired for the tropical weather, will tend to a sleigh full of presents, and the island's tram will be rethemed as a reindeer, complete with antlers and a tail. Kids' crafts on the island will include candy cane reindeer, paper plate angels and snowflake-mobiles. Back on board, the ships will be decked out in holiday splendor, complete with a nearly three-deck-tall Christmas tree in the ship's atrium, "snow flurries" and a tree-lighting ceremony. Holiday entertainment will include a reading of "The Night Before Christmas" by Mrs. Claus, gingerbread house decorating family crafts, and characters in holiday garb. For the Christmas cruises, even more special events are planned. The Wonder's four-night Christmas cruise departs on December 24, while the Magic's special 10-night Eastern and Southern Caribbean itinerary departs on December 16. During the cruises, there will be International holiday caroling by crew members from around the globe, traditional holiday feasts and a Christmas Day visit from Santa Goofy. Multiple faith and interdenominational holiday services will be celebrated on Christmas and Hanukkah cruises. The ships will also throw special on-board New Year's Eve parties, with the Magic's seven-night cruise departing on December 30, while the Wonder heads out on a four-night voyage on New Year's Eve. 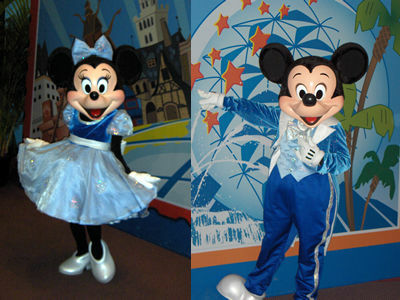 Minnie and Mickey have special new outfits for the Year of a Million Dreams. Photo by Cathy Sowa. 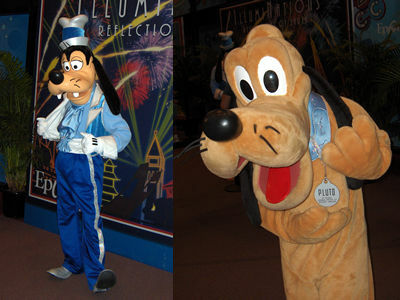 Goofy also has a new outfit, while Pluto has a new dog tag. Photo by Cathy Sowa. Want to help MousePlanet upgrade our park guides? We're looking to add menu information for all restaurants to our Walt Disney World Park Guide. Send photos or scans of menus (no fair copying from other web sites) to menus@mouseplanet.com. Please note that there is a 5MB limit on total attachments in a single email. ?Blizzard Beach closed yesterday for its annual refurbishment and opens on January 7, when Typhoon Lagoon will go down for its refurbishment. ?The Stars & Motor Cars Parade at the Disney-MGM Studios will not be performed on November 11 and 12 for conversion to the Hollywood Holly-Day Parade, which begins on November 13. Mickey's Jingle Jungle Parade at Disney's Animal Kingdom also debuts on November 13, but will not experience any down time due to the changeover. ?The price for the Gospel Brunch at the House of Blues in Downtown Disney has just gone up. Adult prices are now $32.50, up from $31, while children's cost has risen a quarter from $16 to $16.25. ?We've received a little more information on the work going on behind the scrim on East Center Street that we ran a photo of last week. Apparently, they're just replacing rotten wood on the facades back there. The street is safe, for now. ?We're hearing that the scaffolding at the Wilderness Lodge is now covering the entire courtyard area, making the view somewhat less enjoyable. Combined with the loss of direct bus service to the Magic Kingdom, we're hearing numerous complaints about the resort at this time. If you're staying there in the near future, you'll want to bear this in mind so that you're not surprised when you arrive. ?Disney's Animal Kingdom has another new baby to welcome. Aibuni, a 9-year-old giraffe, gave birth to a healthy daughter on October 7. The calf, Aibuni's first, was named Imara ("strong" in Swahili). They are both expected to rejoin the herd on the savannah in the next few weeks, so keep an eye out for them if you're going soon. 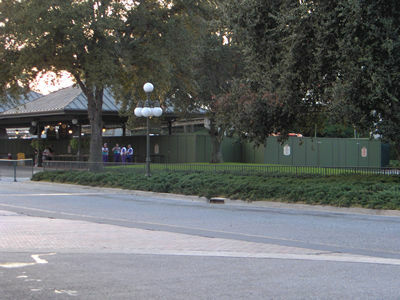 Work continues on the bus stops at the Magic Kingdom's entrance. Photo by Cathy Sowa. Don't keep it to yourself! Send us your news tips, rumors, and comments. E-mail Mark here. October 30, 31. Mickey's Not So Scary Halloween Party. September 29 ? November 12, Epcot International Food & Wine Festival. September 29 ? November 12, Eat to the Beat Concert Series. October 29 ? November 2. Disney Pin Cruise. Nov. 10?12. Festival of the Masters. Nov. 11?12. ABC Super Soap Weekend. Nov. 13, 17, 27, 28, 30, Dec. 1, 4, 5, 7, 8, 11, 12, 14, 15, 18, 19, 21, 22. Mickey's Very Merry Christmas Party. Nov. 13 ? Jan. 1, 2007. Hollywood Holly-Day Parade. Nov. 13 ? Jan. 6, 2007. Mickey's Jingle Jungle Parade. Nov. 13 ? Jan. 7, 2007. Osborne Family Spectacle of Lights. Nov. 20-26, 2006. No pool-hopping for DVC members. Nov. 23, 24, 26. Old Spice Classic. Nov. 24 ? Dec. 30. Holidays Around the World. This week's question: How many Audio-Animatronic characters appear in the Country Bear Jamboree? Stay tuned to next week's park update for the answer. Jack Nicklaus won the inaugural Walt Disney World Open Invitational in 1971. He would win the next two events, the second of which featured the new name of the Walt Disney World Golf Classic (1973). The tournament has seen several name changes, changing to the Walt Disney World National Team Championship in 1974, the Walt Disney World Golf Classic in 1982, the Walt Disney World/Oldsmobile Classic in 1985, the National Car Rental Golf Classic/Disney in 1998, the Disney Golf Classic in 2002, and finally the Funai Classic at the Walt Disney World Resort in 2003. This year's tournament, currently played on the Palm and Magnolia Golf Courses, was won last week by Joe Durant. 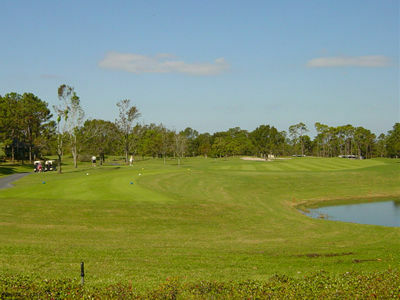 The Lake Buena Vista Golf Course was used as one of three courses in the annual tournament at Walt Disney World until golfers complained about the inequity of cutting golfers after two rounds, when some did not play the toughest course. In recent years, the tournament has now been played exclusively on the Palm and Magnolia courses, with the final two rounds being played on the Magnolia. Photo by Mark Goldhaber. Big Thunder Mountain Railroad ? closes for refurbishment November 15. Timekeeper ? is closed for good. The Monsters, Inc.-themed The Laugh Floor Comedy Club is expected to open in January, 2007. Splash Mountain ? closes for refurbishment January 2?27. The Many Adventures of Winnie the Pooh ? closes for refurbishment January 28 ? February 11. The Seas with Nemo and Friends ? is now in soft-open status. It is possible that it may close at any time up until its official grand opening, but things are reportedly running smoothly and the attraction should remain open. The Wonders of Life pavilion ? will amazingly return and be open from November 26 through December 31..
Mitsukoshi Teppanyaki ? 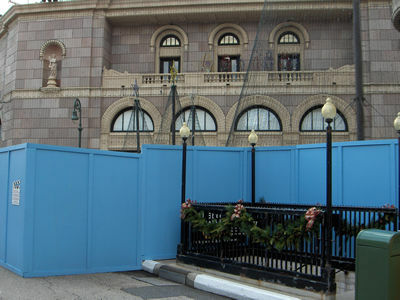 closes for refurbishment January 15 ? May 25, 2007. Journey into Narnia: Creating the Lion, the Witch and the Wardrobe ? is closed for refurbishment through November 10. Rock 'n' Roller Coaster ? closes for refurbishment January 7 ? February 10, 2007. Fantasmic ? will not be performed November 1?8 while work is done on the island stage. Disney-MGM Studios Backlot Tour ? closes for refurbishment November 11?13. Finding Nemo ? The Musical ? opens in the Theater in the Wild on November 12, with soft openings slated to begin on November 5..
All-Star Movies Resort ? the Fantasia pool is closed for an extensive rehab through February 18. All-Star Movies guests can use the "quiet" pools as well as the main pools at the other All-Star resorts. All-Star Music Resort ? Conversion of Calypso buildings to Family Suites continues. All work had been expected to be completed by October 13, but that date has not been met. All buildings not containing Family Suites will be renovated between January and June, 2007. All-Star Sports Resort ? All buildings will be renovated between June and November, 2007. Polynesian Resort ? Work is now underway on the complete refurbishment and upgrading of rooms and hallways in all buildings, which is expected to be completed later this year. Tahiti is currently being worked on, with an expected completion date in mid-November. The reconstruction and expansion of Captain Cook's Snack Company is not scheduled to be completed until early December, though it's possible that it might soft-open before Thanksgiving. Saratoga Springs Resort and Spa ? Phase I's four buildings and Phase II's eight units are complete, Construction on the six buildings of Phase III is underway, with the six units expected to be completed in mid-2007. The new buildings comprise two additional sections, to be called The Carousel and The Grandstand. Wilderness Lodge ? Refurbishment is taking place on the water feature that begins as a spring in the lobby and works its way down to the themed pool area. Blizzard Beach ? Closed for annual refurbishment October 29, and reopens on January 7, 2007. Typhoon Lagoon ? 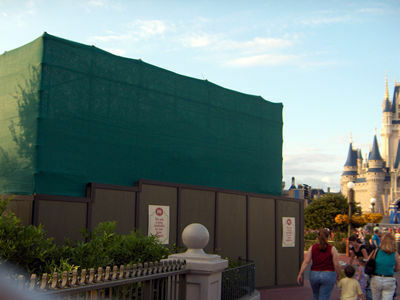 closes for annual refurbishment on January 7, 2007, and will reopen on March 18, 2007. Cirque du Soleil ? La Nouba ? performs Tuesdays ? Saturdays. Also, no performances November 19?21. Mickey's Not So Scary Halloween Party. Oct. 30, 31. Get your costumes ready. The Disney characters will certainly be wearing theirs. (link). Epcot International Food & Wine Festival. Sept. 29 ? Nov. 12. The 11th annual celebration of things gustatory, plus the Eat to the Beat concert series (link). Disney Pin Cruise. Oct. 29 ? Nov. 2. This year's cruise is themed as "Cruisin' Through Time" (link). Festival of the Masters. Nov. 10?12. Disney's annual arts festival at Downtown Disney's West Side, now sponsored by Sharpie! (link). ABC Super Soap Weekend. Nov. 11?12. Your favorite ABC soap opera stars converge on the Disney-MGM Studios (link). Hollywood Holly-Day Parade. Nov. 13 ? Jan. 1, 2007. The Disney-MGM Studios parade gets a holiday makeover. Mickey's Jingle Jungle Parade. Nov. 13 ? Jan. 6, 2007. The Animal Kingdom parade trades its Jammin' for Jingle in this holiday makeover (link). Osborne Family Spectacle of Lights. Nov. 13 ? Jan. 7, 2007. Jennings Osborne's amazing display returns to the Studios (link). Old Spice Classic. Nov. 23, 24, 26. ESPN Regional presents the inaugural 8-team, 12-game tournament, featuring West Virginia, Virginia Tech, Arkansas, Minnesota, Southern Illinois, Montana, Marist and Western Michigan (link). Holidays Around the World. Nov. 24 ? Dec. 30. Epcot's World Showcase gets storytellers, special entertainment and crafts for kids, the Lights of Winter and a spectacular Christmas tree (link). Festival of the Seasons. Dates TBA. Downtown Disney gets a holiday makeover (link). Mickey's Very Merry Christmas Party. Nov. 13, 17, 27, 28, 30, Dec. 1, 4, 5, 7, 8, 11, 12, 14, 15, 18, 19, 21, 22. Snow on Main Street, free hot cocoa and cookies. What's not to like? (link). Taping of the Walt Disney World Very Merry Christmas Parade. Dec. 1?3. Regis, Kelly and all those performers arrive, and they run those floats slowly down Main Street again and again, causing traffic jams and much merriment in the search for the perfect shot. Pop Warner Super Bowl. Dec. 3?9. Football players and cheerleaders invade the resort for the pigskin championships (link). MouseFest 2006. Dec. 3?11. The annual gathering of the Disney Internet community takes place at sea from Dec. 3?7 and on land from Dec. 7?11 (link). Mickey's Very Merry Christmas Parade. Dec. 23 ? Dec. 31, plus nights of Mickey's Very Merry Christmas Party. The annual classic returns to the Magic Kingdom. Pleasure Island New Year's Eve. Dec. 31. Pleasure Island celebrates the actual New Year (link). Atlantic Dance Hall New Year's Eve. Dec. 31. Ring in the New Year at the BoardWalk's own dance club (link). Walt Disney World Marathon. Jan. 7. Registration is full (link). College Cheerleading and Dance Team National Championship. Jan. 12-14. Teams descend on the Wide World of Sports (link). Disney's Pirate & Princess Party. Jan. 22, 26, 29, Feb. 1, 5, 8, 12, 15, 23, 26, Mar. 2, 5, 8. A new hard-ticketed event celebrates the the pirates and princesses in all of us (link). National Dance Team Championship. Feb. 2-4. Teams descend on the Wide World of Sports (link). National High School Cheerleading Championship. Feb. 9-11. Teams descend on the Wide World of Sports (link). Twirlmania. February 16?19. Twirlers, auxiliary guard, pom, and dancers descend on the Wide World of Sports (link). Atlanta Braves Training Camp at Disney's Wide World of Sports complex. Mid-February ? late March (link). Cheer & Dance National Championships. February 24?25. School & Youth Rec Cheer February 24, All-Star Cheer & Dance February 25 (link). Cheer & Dance National Championships. March 2?4. All Star/Studio March 2, School Dance March 2?4 (link). ESPN ? The Weekend. March 2?4. Synergy strikes again as Disney's flagship cable network returns to the Disney-MGM Studios (link). National All Star Cheerleading Championship. March 9-11. Teams descend on the Wide World of Sports (link). Walt Disney World Inline Marathon and Half Marathon (link). April 1. Strap your skates on to race from the Wide World of Sports Complex to the Disney-MGM Studios and Epcot, and back again. Epcot International Flower & Garden Festival. April 5 ? June 3. Epcot comes alive with topiaries, other floral displays, gardening demonstrations and the ?Flower Power? concert series at the 14th annual event (link). USASF Cheerleading & Dance Worlds. April 21-22. Teams descend on the Wide World of Sports (link). Disney's Minnie Marathon Weekend 5K and 1 Mile (link). May 5. The short runs of the ladies-only running weekend take place at and near Downtown Disney. Registration is now open (link). Women Run the World 15 K (link). May 6. The course starts at Animal Kingdom, goes through the Studios and ends at Epcot. Registration is now open (link). Florida Residents have their own discounts, using booking code FBY. Availability dates are October 5 through December 23, and rates are $5 more than the AP rates. Both of these rates can be booked up until December 23. Walt Disney World has announced a new discounted offer for residents of Canada. The deal, available most nights from January 1?11 and January 15 ? February 14, offers free Park Hopper and Water Park Fun & More options with purchase of a package. Prices start at US$377 per adult, double occupancy, at Disney value resorts. No other discounts apply. Use booking code ZCV for this offer. Reservations prior to November 2 require a Canadian address, which seems to point to this offer being expanded to U.S. visitors after that date. Packages must be booked by December 16. Small World Vacations, a MousePlanet sponsor, has announced a special offer for those traveling during this year's Super Soap Weekend event. The travel agency will give one free One Life, Many Voices CD with each qualifying Disney Magic Your Way Vacation package that falls during 2006 Super Soap Weekend (November 11 and 12) booked with Small World Vacations (link). The One Life, Many Voices CD is an independent fundraising effort with 100% of net proceeds going directly to aid 2005 Hurricane Disaster Relief, created by the stars of the ABC soap One Life to Live. The free CD will be mailed with final travel documents. If the guest cancels their Super Soap vacation reservation, the offer is null and void. Small World Vacations' minimum night stay policy applies. Small World Vacations has donated to the One Life, Many Voices Hurricane Relief Fund on behalf of their guests. The Radisson Resort Parkway is now the Radisson Resort Orlando-Celebration! The resort, a MousePlanet sponsor, has announced their standard rates through the end of 2006. Note that the nightly rates do not include a $7 per night resort fee. Click here for more information, or here to make reservations now. Walt Disney World's entire ticket price structure changed as of January 2, 2005, to the new ?Magic Your Way? passes, and prices increased on January 1, 2006, and again on August 6, 2006. Advance purchase discounts are only available on tickets above the base ticket of at least 4 days, with higher discounts on those tickets with both options. Prices do not include 6.5% Florida sales tax. Hours and entertainment schedules are currently available through March 2007. Movies begin at 8:40. Movies are preceded by a campfire at 7:30 and a singalong at 8:00. The November movie schedule was not yet available at press time..
Soilwork with Special Guest Threat Signal (main room), $17 in advance/$20 day of show; 8 p.m.
Pete Yorn (main room), $23 in advance/$25 day of show; 8 p.m.
New Found Glory with The Early November, Cartel + Hit The Lights (main room), $17.50 in advance/$21 day of show; 8 p.m.
Apostle JL Cash and Praise (gospel brunch), $32.50 adult, $16.25 child (3-9); 10:30 a.m., 1 p.m.
Gov't Mule with Donavon Frankenreiter (main room), $25 in advance/$27.50 day of show; 8 p.m.
+44 with special guest The Matches (main room), $20 in advance/$22 day of show; 8 p.m.
Hellogoodbye with Reggie & The Full Effect, Cute Is What We Aim For and David Melillo (main room), $13.99 in advance/$16 day of show; 7:30 p.m.
An Evening with Col. Bruce Hampton and The Aquarium Rescue Unit (main room), $20 in advance/$23 day of show; 9 p.m.
TBA (gospel brunch), $31 adult, $16 child (3-9); 10:30 a.m., 1 p.m.
House of Blues & Fantasma presents Keller Williams with Intermission with Radio Active (main room), $18 in advance/$22 day of show; 7:30 p.m.